"The bus passed a lady with a pram, struggling over icy ground. She put her hand out to indicate she wanted the bus to stop, but it was after the bus had passed - I only witnessed her indication as I was sitting near the back of the bus. The driver must have noticed in his rear view mirrors, as he stopped the bus [and went back to let her on]. I think this is great customer service. I was impressed [the driver] took the time to attend to the customer's needs and go a bit further than expected." 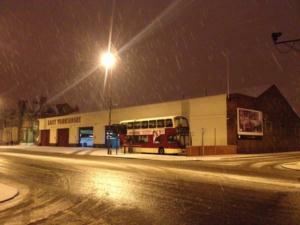 "I caught the [early morning] X46 bus this morning from Beverley to York in all the snow. Just to say a big thank you to the driver who did a great job and got there safely and very nearly on time. He was brilliant!" "I have written to you, about two years ago, saying how much I appreciated the work of ALL your staff. I say it again, with respect, especially after this latest almost twelve weeks of awful weather, snow, ice and sub-zero temperatures. I have happily put pen to paper once more to praise all your drivers (especially your group of kind and helpful lady drivers), and also maintenance and cleaners, who have kept your buses on the road. As a 'town lad'...I really do appreciate your bus services. Thank you all again." "The weather conditions were very bad, snow blizzards and icy roads, and I want to let EYMS know how I cannot praise the driver enough. He was outstanding in the way he made the passengers feel safe and how well he controlled the bus." "Well done to the driver who managed to get us back to Withernsea." "Hats off to the Withernsea drivers, the routes around here must be some of the toughest in these conditions." "Well done EYMS last night down Anlaby Road, [another operator] let everybody down but you kept running!" "I would like to compliment EYMS for the excellent Twitter service. Not many companies have such a perfect Twitter-team." "I am writing to say a huge thank you to the driver of the X47 on Friday... [as the bus departed from Hull] the weather was getting progressively bad as we came to Beverley, but he drove the bus for us over the Arras. He was great, and got us to Market Weighton safely. He needs a golden star and driver of the month. Very well done driver, from an appreciative passenger." "Thanks again for all your efforts in this terrible weather." "Well done to all drivers, it's bad enough driving a car in this weather, don't know how you do it!" "Well done to your staff in challenging weather, and excellent updates from your tweets, keep it up." "Big up to all the bus drivers tonight, got me home safe and sound, hope they do too." "You're doing an amazing job with all the updates, thanks. I hope all the drivers get home safe as it's very icy out there now, get home okay too #respect "
"Hats off to your drivers today, it's been a nightmare [on a certain route] today, bad in a car, never mind a bus!" "East Yorkshire Buses are really getting Twitter right during this recent winter snap. Doing a great job. And I'm usually first to moan about them." "[EYMS Twitter] is doing a brilliant job. Better and quicker info than any media."